Gwen taking a minute to play in one of the many smaller waterfalls lining the river banks of the Lewis River. 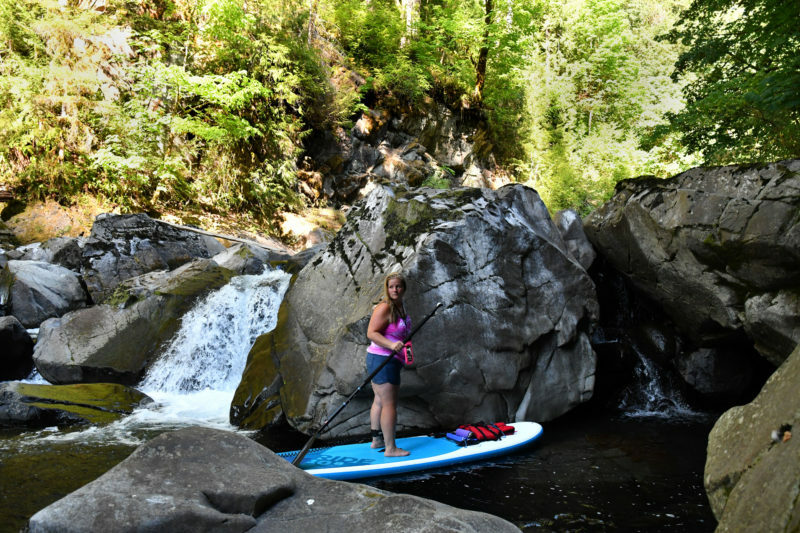 The goal is to keep your paddle board as close as possible to the rock wall and carefully hold your paddle against the rocks and guide the water down the paddle. It’s harder than it looks! The Lewis River section of this paddle is lined with deep woods traditional of the Pacific Northwest. 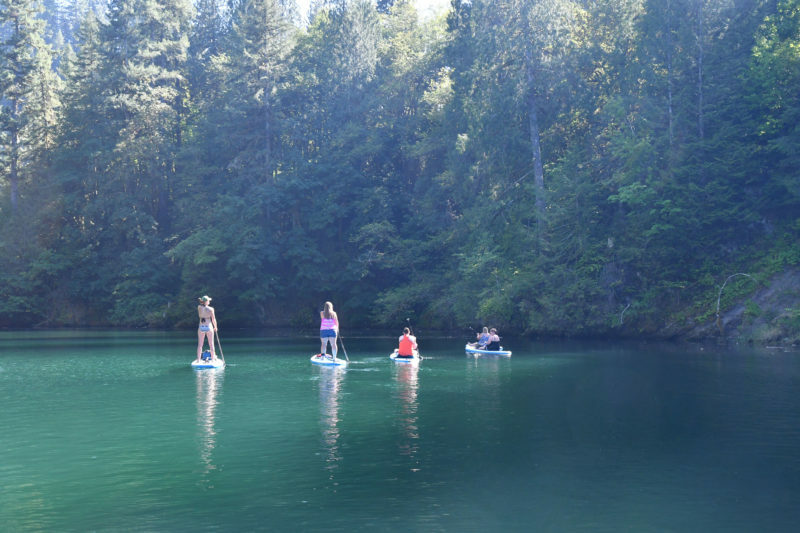 Deep green waters and calm paddle conditions make this a relaxing SUP Tour suitable for all paddle levels. It’ common to see all types of Northwest wildlife along this section of the river, including Tiger Muskee! You can’t help but enjoy yourself on the water! The Lewis River “ends” at the roped off buoy line blocking paddlers from accidentally wondering into the Merwin Dam. 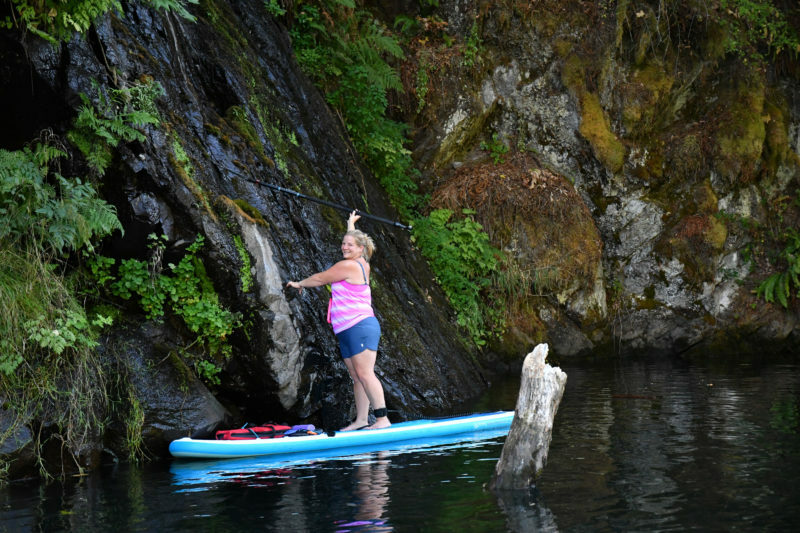 From here, it’s a mild upriver paddle up the crystal clear waters of Canyon Creek. Loren couldn’t resist flinging some water with her paddle during our brief rest at the buoy line! The end of the trip is rewarded by some small but gorgeous waterfalls flowing down Canyon Creek. Each paddler got the chance to paddle right up to the base of the falls and challenge themselves by holding position as long as they could against the rushing current! 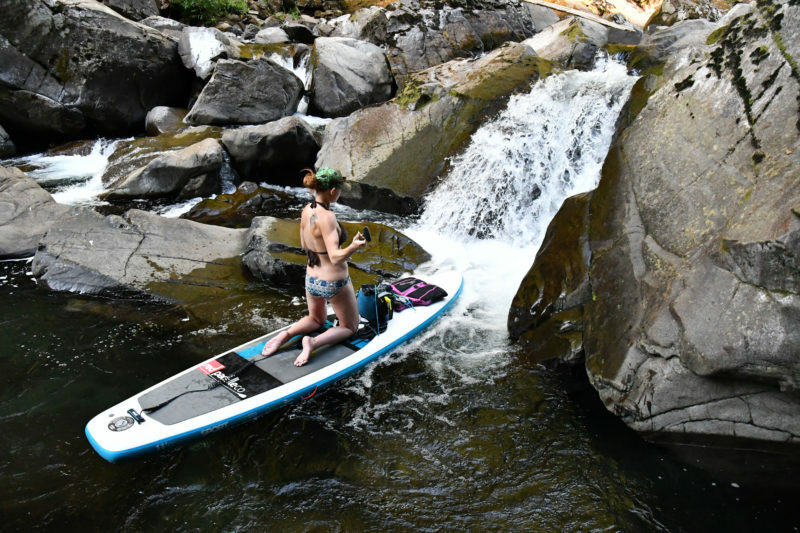 Canyon Creek is truly breathtaking and a perfect representation of what paddle boarding the Pacific Northwest is all about. 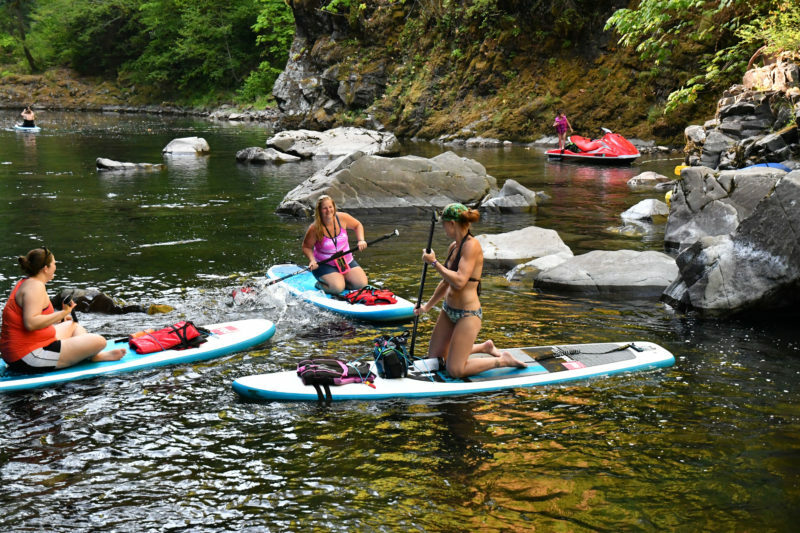 These ladies did amazing on their Private Guided SUP Tour! 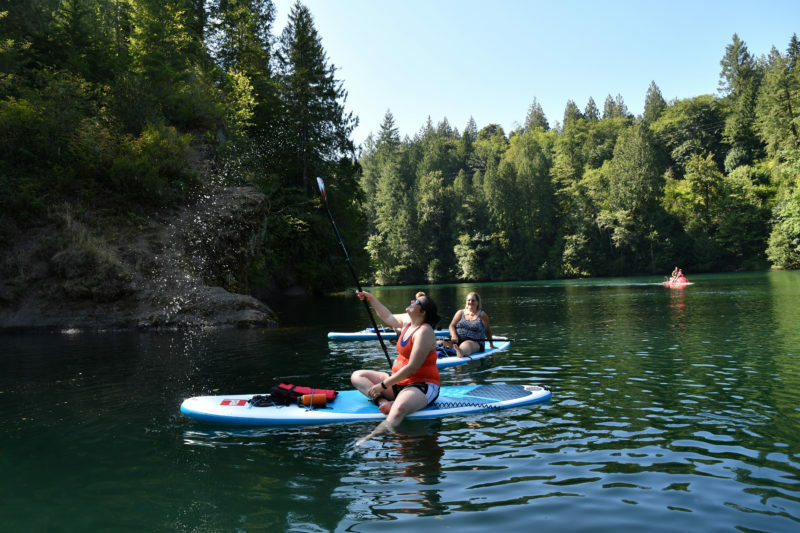 Gwen, thank you so much for choosing NW SUP & Fitness as your personal SUP Guides and I hope you had as much fun as we did! Hello There. I discovered your blog the usage of msn. This is a very well written article. I’ll make sure to bookmark it and return to learn more of your useful information. Thank you for the post. I will certainly comeback.